Many people looking for essential ways of doing something while relaxing often resolve to Knitting. It is a perfect way to rest and zone out from the hassles of the week. However, the activity doesn’t come easy, not with the wrong choice of a Knitting Set. Whether you are a seasoned Knitter’s or a beginner, choosing the best set goes a long way in enhancing good performance. Luckily, there is always a needle set that meets your expectations. If you are looking for unparalleled experience in knitting with needles of superior design and quality, LIHAO Bamboo Knitting Set is the best. LIHAO needles are well known for their sleek design and reliable construction. As opposed to other needles made of Aluminum, LIHAO needles are curved from bleached bamboo, which lets you knit quietly. Furthermore, the bleach makes them stronger than the basic wooden hooks. The needles come in a range of sizes, both high and low, making them ideal for amateurs and seasoned knitters alike. Their smooth finish feels comfortable in one’s hands and maintains a subtle rhythm when following a particular pattern. LIHAO needles offer no room for dropped stitches, they stay on the needles and don’t pull off easily. They are light and are ideal for those who require less tension. This is also aided by the thumb rest engraved in the design. Should you purchase LIHAO needles and become dissatisfied, you can always return them and get your money back as they come with a 365-day money back guarantee. This allows you to buy the product with confidence. Coming in a convenient carrying case, Needlemaster offers a broad range of US needle sizes from 2 to 15 and four cable sizes. Amidst mixed reactions on how the needles go together, they still make the best needless on the market. The needles are color coded and made from aluminum for durability and firmness. 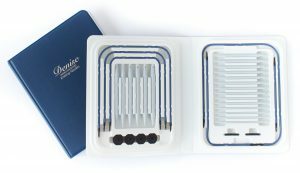 Highly versatile and convenient, the Needlemaster set offers beginners and professionals room to make circular, flexible straight and stitch holders. The points and the flexible cables are user-friendly and allow one to shift from straight to circular needless, not to mention stitch holders. All the needless are numbered and organized and are easily identified using the embossed values inside the case. Also featured, are three clear pouches for buttons, cable couplers, and gripper. The cables feature metal connectors and a screw top to seamlessly fit every needle, which securely locks in place for good connection. The other cable couplers join with others to make extra long cables. Apart from number identification, the Needles can also be told apart using their metallic colors, which include silver, rose gold, emerald green, electric blue, and purple among others. More cables and accessories for this Interchangeable set can be bought at an affordable price. If you are in search for needles that suit big and flat projects, Needlemaster set of needles comes highly recommended. Are you looking for Needles with countless variations at your fingertips? Knit Picks Sunstruck Wood needles is the answer. 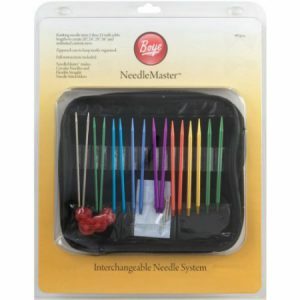 These needles let you make perfect needles for any project with various options from the interchangeable tips and cables. 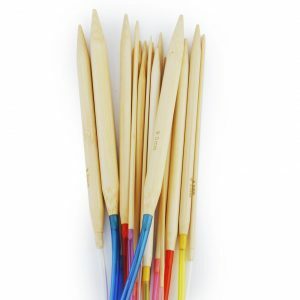 The needles are beautifully made with a blond twist and rainbow wood design and are stored in a convenient vinyl pouch. With golden layers of sturdy laminated birch, it allows each stitch be nicely displayed on its smooth finish. Perfect for variegated yarns and dark works, these needles have the same stability and strength that you love. It also comes in quite a number and cable lengths in various US sizes ranging from 4 to 11. The desired cables are only attached to the needle tip by turning and screwing to create a perfect size that suits your project. The vinyl case holding the needles have different pocket styled case for cables and end caps. This smaller case comfortably fits the inside of the main pouch where there are lots of extra pockets in its walls for extra needles, should you choose to collect more. Specifically designed for circular knitting, these needles also fit other types of projects making them versatile. They also have a good value for your money. If you’ve once taken a stroll down the craft store for a needle set and got overwhelmed by the availability of many options, then you haven’t tried the Clover Takumi Set. They come highly recommended and are made from the reputable Takumi Bamboo sticks, which grips yarns better and reduces the chances of dropped stitches. These Needles are ideal for everyone, and with their assortment, together with their cords, one can create up to 60 possible combinations. The set comes with 12-needle tip sizes, and they range from 3 to 15, five cable lengths, which are all zipped up in a leather-like case that makes transporting them easy. With the precise and smooth finish from tip to the cord joint, the needles slide in and ensure a smooth ride for every stitch. The case and its contents offer versatility and can be conveniently used to knit wherever and however one chooses. Its cables are flexible but do lack memory. However, it is not floppy at all! Its tips are sharp, and the tapers are longer than those of other needles. This, with its other amazing features, knitting with Clover Takumi offers a worthwhile experience as it is easy to grip and smooth to the touch. LIHAO Mixed Aluminum Handle Crochet Hooks make the bet gifts for mom, aunt, sisters or all the crochet enthusiasts. They come in 22 pieces with different sizes. Half of them though, are silver in color while the rest can be checked online. In their carrying leather case, they have been perfectly organized into two rows. Notably, the needles are made from aluminum with rubber parts and are relatively stable and smooth to the touch. While knitting, one can use thin crochet threads and requires small hooks to achieve precision. They come in various sizes as it can be seen through the arrangement on the case. The large ones are on the left and are colorful while the small ones are on the right and are silvery. The carrying case also makes it convenient for stitch markers and holding all the needles together. Each piece of the needle can be differentiated from another as all of them have been marked with their sizes on them. The smallest size is 0.08mm, and the biggest is 10mm. The LIHAO Mixed Aluminum Handle Crochet Needles have all the characteristics that a beginner or a professional is looking for. They make the best substitution for other disappointing wooden sets and are surprisingly user-friendly and smooth to the touch. Knitter’s Pride Dreamz line is made of dense birch wood, which is laminated to make it much more robust and hard than ebony or rosewood. 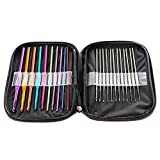 They have double points, are circular; interchangeable and fixed, and straight with crochet hooks making them a perfect choice for anyone looking for a knitting set. 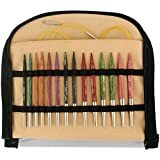 Knitter’s Pride Deluxe comes with Needles of 4.5-inch tips in various US sizes beginning from size 4 to 11 all in a range of eleven different radiant colors. Each size has its color assigned, which also carries in all the needle styles. This comes in handy during collection as one can tell different pair with their distinct colors. Apart from the needles, Knitter’s Pride Dreamz packs four cables, a 24″, a pair of 32″ and another one of 40 inches, a total of eight end caps, four cable keys and a whole set of needle size ID tags. All these are contained and organized in a transparent vinyl case that holds the needles well and can be tightened by holding its base. Joined, the cords and the tips measure up to 16 inches in length, making them relatively versatile for projects. 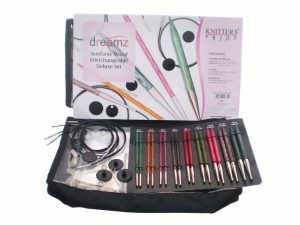 If you are a beginner looking for a Knitting Set that will exceed your expectations, get yourself Knitter’s Pride Dreamz Deluxe. 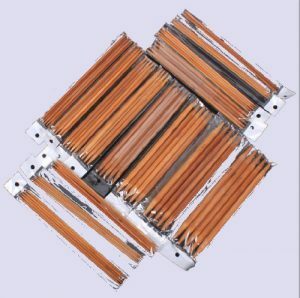 The Ostart 5 Sets of 15 Sizes 8” Double Pointed Carbonized Bamboo Knitting Kits Needles Set is slowly gaining popularity because of its smooth feel, its versatility and its good price. Although it’s been met with claims that it has a mediocre quality, it still one of the most basic choice for others. The intimate feel is as a result of its build from bamboo, which also makes it user-friendly. It is Carbonized to give its color and achieve a beautiful design. With five sets in fifteen different sizes of double points, that’s a lot of needles with an insanely low price. 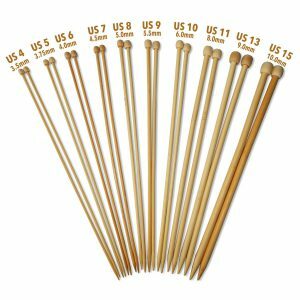 For many who are looking for a broad range of needles with an excellent quality, Ostart Carbonized Bamboo Knitting Needles cuts it. The set has all the US sizes except the 2.5mm and 3.0mm needles. Although it has a good quality, it comes as a recommendation that one rubs each needle with a waxed paper before the initial use. The tips aren’t rounded like other Bamboo Needles. 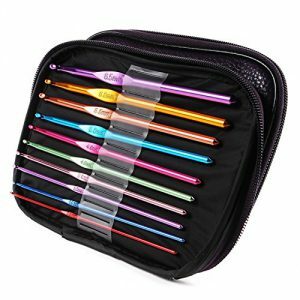 Coming from a reputable company, these interchangeable knitting needles have stuck around for years. They make the best choice for some people and can be procured in colors that include blue and pink. They come in a beautiful case with the option of Della Q case and set with silk, unlike the old boring plastic cases. The set’s cords can also be gotten online in exciting colors. Denise Interchangeable Needles are the perfect choice for home use as well as any other Knitting enthusiast. They come in a set that contains both straight and circular needles. The straight needles have varied sizes of 5 to 15 and lengths of between 9 and 34 inches. On the other hand, the round ones have the same sized tips but with inches of between 17 and 58 inches. All the needles come well organized in a strong case that is airline safe. This way, you can have fun with different types of needles at your disposal and right at your fingertips. Accompanying the needles are stitch holders, a pair of extenders, and four end buttons. The extenders are used to increase the length of the cords by joining different sizes together. Both the needles and the cables are made of hard plastic. Knitter’s Choice Bamboo 14-Inch set with Case Organizer comes with a total of ten pairs of 14-inch long bamboo needles, with the US sizes that range from 4 to 15 mm. They have been beautifully designed with utmost superior craftsmanship and are accompanied by a bonus premium canvas carrying case. With the needles, one can quickly switch between the different sizes and accurately gauge their projects. It provides a firm grip to the yarn reducing chances of dropped stitches. It makes a perfect choice for beginners in knitting. 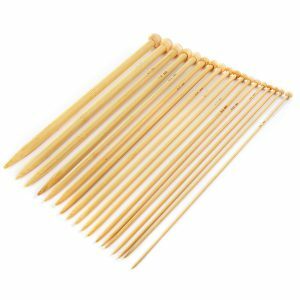 The needles are made from the thick bamboo tree and are bleached to give it a smooth finish and make them strong. They are comfortable to knit with and operate quietly without a sound, unlike the aluminum Needles. One can purchase this product with confidence courtesy of its 100 percent money back guarantee. At any time of use, should you feel dissatisfied, you can always return it, and you will be refunded; it has a lifetime warranty. On top of this, you get a bonus canvas carrying case, which is stylish, portable and provides good organization to your needles and other accessories. Last in our list of the best knitting sets are the XUY 18 Sizes 2.0mm-10.0mm 80 cm Circular Knitting Needles with Colorful Tube. They come in different sizes and colors fitting the preference of any user. Each package contains 18 pairs of different size circular needles ranging from 2mm to 10mm. This makes them among the top versatile needles on the market. They are all made from bamboo and plastic and have also been bleached to make them extra smooth, but vigorous and durable as well. Nonetheless, the smooth surfaces of the colorful tube circular Knitting make them user-friendly and comfortable to use. Also, telling apart all the 80 inch needles isn’t hard as their metric sizes have been marked on them. The lightweight design of the set gives it edge and preference to those who are looking to knit both indoors or outdoors. The tubes are hollow and highly convenient, and even though they are the best for acrylic yarns, they do not work well with silk, alpaca and mohair ones. 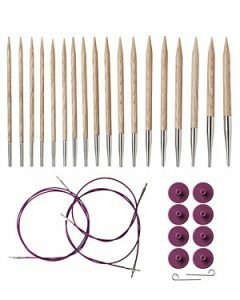 The needles also make the best choice for beginners who are looking to learn knitting without wasting so much money on them. ZXUY Needles come with a year and a half warranty with a friendly customer service support. Should you feel, for any reason, you can always contact the team, and your issue will be addressed. To help you further choose the best knitting set, we have prepared the following guidelines of things to consider before settling on a particular set. Figuring out what knitting needles you need can be a really frustrating task to a complete beginner knitter. There are more options than a person can count and everyone is pointing them in different directions based on what they like or what they are trying to sell. I’m here to give you just the facts. Choosing the right knitting needles shouldn’t be about making someone else happy, it should be about what you need to accomplish your goals. Figure out what you want to make first. Choose the material, needle material that is. Jumping right to the point is easy. You’re here to learn how to choose the right needle, nothing else. Don’t worry; I promise this will be worth your time! The reason we must decide what kind of project we will make with our needles is that it is the single most important piece of information you need to choose the right needle. As you’ve probably figured out by now, there are a few different options when it comes to knitting needles. Some are straight, some are circular with a cord, some have two points, and some allow you to change sizes. That’s a lot of options my friends, and each has their unique purpose. Let’s break them down here. Straight Needles – They come in two varieties, either single or double pointed. Materials used take them include steel, bamboo, aluminum, plastic, and carbon fibers among many more. 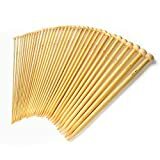 The most reputable and popular are Bamboo Needles. Single-pointed needles have a knob only on one side to keep the stitches from dropping. The other end is sharp. They come in various sizes with the longer needle holding more stitches. The double pointed needles, on the other hand, are pointy on both sides and allows one to stitch from both sides. They are ideal for tubular pieces of garments and are sold in a number of gauges ranging from about five to eight inches. Cable Needles – These types of Needles are tapered on both sides, and are curved or straight in the middle to fit different projects. Circular Needles – they consist of double pointed needles joined by a flexible cable. The needles can be made from several materials. These needles are ideal for many projects and can be used for straight stitching as well. They are often accompanied by interchangeable circular needles that can be attached to the cables when necessary. Double Pointed Needles (DPN’s) are the traditional method of knitting in the round. They are great for projects smaller than 9″ in circumference. Interchangeable needles are the more cost-efficient route to a full collection of circular knitting needles. They can be used for all types of projects, flat and round. Question 1: What shape is the project I want to make? Question 2: How long is it? Or What is the circumference? If you answered less than 18 inches to question 2, a straight knitting needle is your best option. If you answered more than 18″ to question 2, a circular knitting needle with the coordinating size cord is your best option. If you answered less than 9 ” to question 2, double pointed needles are your best option. If you answered more than 9″ to question 2, circular knitting needles with the coordinating size cord are your best option. You will want to choose the cord that is closest to your desired circumference but not smaller. As far as large flat knitting projects, this same rule of thumb applies. For example, if you want to knit a throw that measures 52″ wide, it will be wise to use a 48″ circular knitting needle. If you are a beginner knitter, you’re probably following a pattern or tutorial for your first several projects. If that is the case, you can skip down to the next section where we talk about needle materials. All patterns and (good) online tutorials will tell you exactly what type and size of knitting needle you should use. Many skeins of yarn will include a recommended needle size on the label. As a beginner, you should use this as a guide until you get a better idea of how you can manipulate that to get the results you want. Once you venture away from patterns and start exploring on your own, you will spend this time developing these skills. This is the caveat to both of the examples above. All patterns and yarn labels give the “suggested” needle size to obtain a specific gauge. Gauge is an in-depth topic, but you only need a general understanding of it here. Gauge is a measure of stitches and rows. It is used especially for projects where sizing is important, like clothing. We all have our knitting styles and therefore knit slightly different from one another. These subtle differences mean my stitches may measure different from yours. You should always knit a gauge swatch and measure it to see if it matches the measurements given. If it doesn’t, you will need to make adjustments to your needle size accordingly if you wish your project to come out the size you expect. So Which Size Knitting Needles Should You Choose? I would start knitting with a medium size needle (medium yarn, medium needles), around a size 6 (4mm), 7 (4.5mm) or 8 (5mm). These sizes are often used for medium weight yarns and they feel the most comfortable in your hands. I like these sizes too. If you decide to buy straight knitting needles you may want to consider the knitting needle length too. They range in length from 7 inches which is usually used for children, and go up from there; 8 – 14 inches. These larger sized knitting needles are easier to handle. When starting out, many beginning knitters feel more secure with substantially sized needles in their hands. Another great benefit to knitting with larger needles is that your knitted piece will knit up faster! Heavier weighted yarns create larger knitted pieces, meaning you’ll finish that scarf, hat, or pillow faster when using larger knitting tools. Sweet! Again, if a friend has lent you some free needles, use them! Even if they’re on the smaller side of the size range, hey, you can’t beat free! Just refer to the chart to see which yarn weight pairs up best with your knitting needles. Needles come in a variety of materials. It is up to you to decide what kind of material you like to knit with. This topic is very subjective, and the best way to figure it out is to knit with each type of material. Wood: This is my personal favorite, as I typically knit with bamboo wood needles. These can be a little bit on the more expensive end of the spectrum. But, one set of bamboo knitting needles can be purchased for under ten dollars, so it’s not that crazy. I like the traditional look and feel of the wood needles. They hold up great throughout the years and will last a long time, too. Aluminum: Many knitters swear by aluminum needles, especially loving how quickly the yarn slides off their needles. I’ve found that beginning knitters sometimes can get frustrated by them, but if you already have these on hand, give them a try. I was handed down my aluminum knitting needles from my late grandmother and aunt, who were both a total speed knitters. They might become your favorite knitting material, too. Plastic: This is usually the most inexpensive of the knitting needle types and a fine option for beginning knitters. The yarn will slide nicely off your needle, but won’t be too slippery like aluminum. There is usually a really big selection of plastic knitting needles at craft stores, so they’re really easy to find, also. Knitting needle sizes… why so many options? Making a rushed decision onto buying the Best Knitting Needles may ends up as a big disappointment afterwards. It is best that you sit down and go through a number of reviews of the product you want to buy and see what people are saying about it. For example, people have noted that color coded needles tend to rub off over time and might give you problems while knitting. Similarly, some wooden or Bamboo Needles tend to break especially the smaller sizes. Some Knitting sets come so cheap, while others, which have the same features and do the same tasks, have higher prices. In such a case, it is recommended that one compares their performance before making the decision on what to buy. how to use circular knitting needles? how to hold knitting needles? 1) Pick up the needles in a relaxed fashion. 2) Place the needles on your four fingers, holding the tops with your thumbs. how to cast on knitting needles? 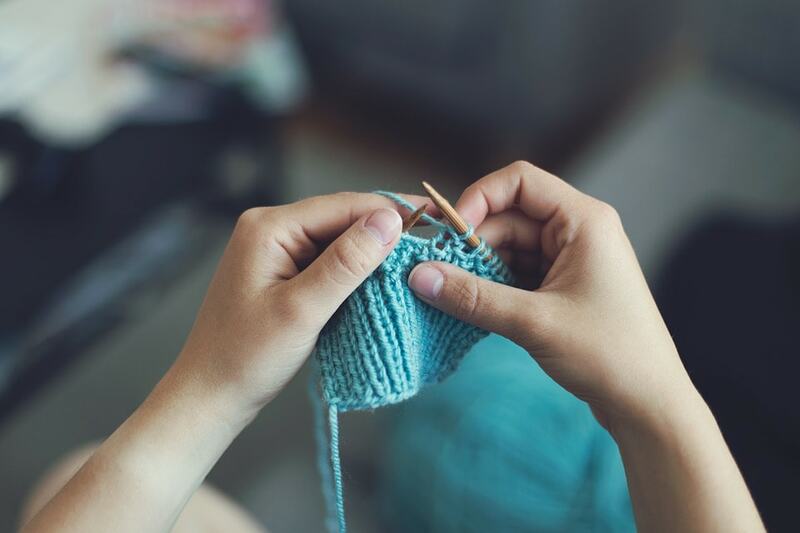 To cast on while knitting, start by making a slip knot, and slide the knot onto your knitting needle to make your first stitch. Then, hold the needle in your hand and wrap the yarn around your thumb from behind. Put the needle in front of your thumb, and slide it into the yarn, pulling the yarn off of your thumb? how to measure circular knitting needles? So when a pattern calls for Size 7 16 inch needles, it’s first referring to the size of the needle head and then to the length of the needles from tip to tip. Let’s take a look at the standard sizes for circular knitting needles. how to fix knitting mistakes on circular needles? Take your work off the needles and lay it down somewhere flat. Slowly pull the working yarn out of the stitches until you undo the extra stitch. After ripping out knitting comes picking up the stitches, you want the right half of the stitch or “leg” of the stitch to be in front of the needle. how to store knitting needles? Keep the needles in plastic insert sheet holders, and put hook-and-loop tabs across the top to hold them closed. Put the needles into zip top bags. Punch holes across the bottom to fit over the notebook rings and keep the top facing out. Write the size of the needles on the bag with a permanent marker. Knitting Needles come in various types, sizes, and different material constructions. Making the best choice is often a hard thing for many. Unsure of which product meets their needs, they end up buying needles that will not last long. The above reviews, however, serve to help them make the right decision. In as much as they might not be exactly what you want or what you’ve had an experience with, there can’t be an exception in the list. All in all, we hope you find the best that exceeds your desires from the list.